Oklahoma fossil record: Macrofossils have been found only in the Woodford Shale Formation of Oklahoma, deposited during the Devonian Period. Because plants break apart and often are found in separate pieces, different names may be given to different parts. Callixylon is the name given to only one part—wood—of a large tree known as Archaeopteris. Only Callixylon, preserved as petrified wood, has been found in Oklahoma. 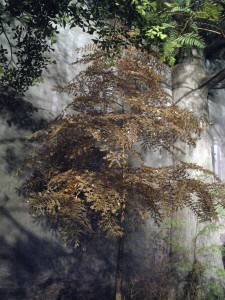 Archaeopteris/Callixylon was a woody tree that grew up to about 60 feet (20 meters) tall, but used spores to reproduce. It is the closest known relative of seed plants that did not bear seeds.